The Rail budget presented by Lalu Prasad as every time has nothing for us Belgaumites. All those demands made by the Belgaum Chambers and others have gone on deaf ears. What we got from the budget is here. Survey works are proposed to be taken up:Dharwad–Bayalahongal–Belgaum. This survey is being done from the last budget and still is nothing has been done. In all the Rail budget in line with expectations as I atleast had no expectations what so ever with my city in mind. The only plus thing is, if I get a ticket to travel I would just save 5% of my travel allowance. As always we in north karnataka always suffer. 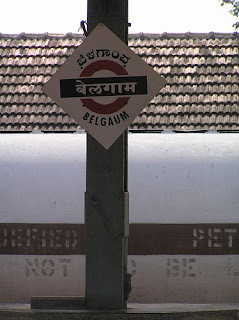 i was expecting some trains from bangalore via belgaum so that i can travel every week but all hopes down the water. Also a direct line from dharwad/hubli to belgaum would have helped a lot of people who travel every day by bus on this route. The intercity between bangalore-hubli could have been extended upto belgaum. Now a new wait till 2009 rail budget.